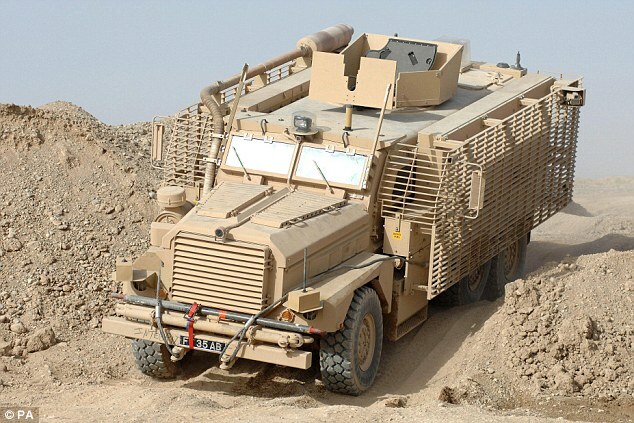 Three British soldiers have been killed and six others injured in a huge roadside bombing in Afghanistan - the first troops to have died in a heavy-armoured Mastiff vehicle. The soldiers, Corporal William Savage and Fusilier Samuel Flint of the 2nd Battalion, Royal Regiment of Scotland, and Private Robert Hetherington, of the 7th Battalion, Royal Regiment of Scotland, were travelling in the Nahr-e Saraj district of Helmand on a stretch of road that had been in regular use and was believed to be in a safe area. Their deaths come as international forces prepare to leave the 12-year-old war. 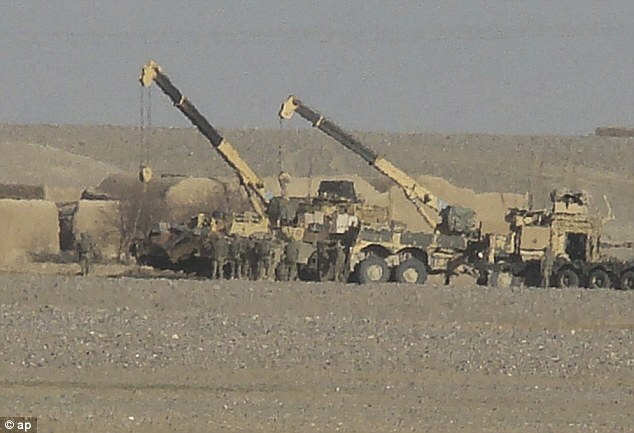 Military officials are investigating whether insurgents are designing bigger bombs aimed at piercing the 23-tonne Mastiff's armour. They will not only look at how the bomb was made, but also into checks used by Afghan and British troops on patrol. “If you build a big enough bomb it will overcome a Mastiff. It's just never been done before,” a military source said. The convoy was on Route 611, a new road that had been used to show the reconstruction taking place in the province. Increasingly, the Afghan army and police are carrying out searches for IEDs as they take over security duties. 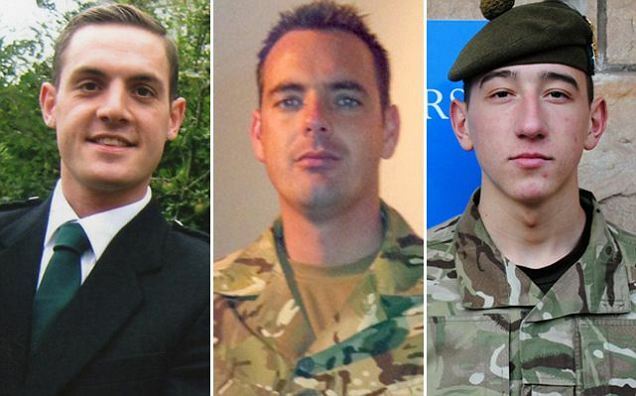 The last time so many British soldiers were killed in one incident was last March when six died after their Warrior vehicle was blown up by an IED about 25 miles north of Bashkir Gash. The Taliban announced last weekend its “spring offensive” had started with a series of bombings. The insurgents said they were running large parts of the country, publicising the case of a father who executed his 18-year-old daughter, on their orders, after she had run away from home. 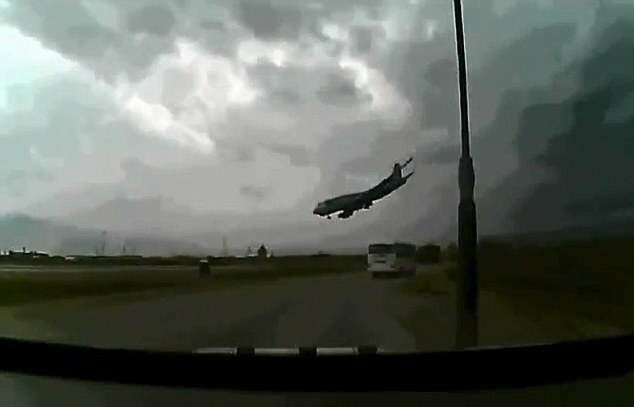 (CNN) -- A cargo plane crashed in Afghanistan killing all seven crew members on board Monday. All seven were U.S. citizens, the cargo carrier National Airlines said. 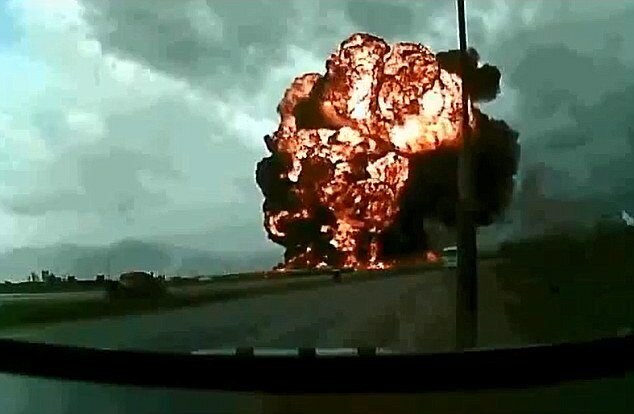 The crash happened shortly after takeoff from Bagram Air Base in Afghanistan, the U.S.-based company said. The Boeing 747-400 was en route to Dubai, United Arab Emirates. "This was a purely cargo flight and no passengers were aboard," a company statement said. "Cargo consisted of vehicles and routine general cargo." National specializes in moving freight for the military and businesses, as well as charter passenger service in the Middle East. But Taliban spokesman Zabiullah Mujahid said his group shot down the aircraft and that "several foreign soldiers were killed." That claim could not be immediately verified. But in the past, the Taliban has exaggerated casualty figures. "This is a devastating loss for our family and we'll work diligently with authorities to find the cause," National Airlines President Glen Joerger said in the statement. "Our focus at this time is on the family members of those we've lost, and on assisting the NTSB (National Transportation Safety Board) and Afghanistan Civil Aviation Authority in their investigations." Six of the victims were from Michigan, National said, and they were identified as Brad Hasler, Jeremy Lipka, Jamie Brokaw, Rinku Summan, Michael Sheets and Gary Stockdale. 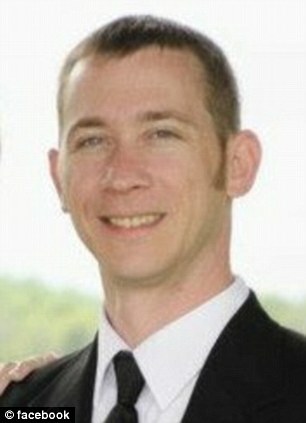 The other victim, Timothy Garrett, was from Kentucky. BAGHDAD — Iraqi soldiers backed by tanks retook control of a Sunni town north of Baghdad on Friday after gunmen withdrew without a fight, although violence erupted at three Sunni mosques and clerics called for the formation of a tribal army to protect Sunni cities. The Sunni gunmen had seized Suleiman Beg on Thursday after a firefight with security forces, one in a string of incidents that have left more than 170 people dead in Sunni Muslim towns in western and northern Iraq during the past four days. Police and military officials said army units entered Suleiman Beg after negotiations with local tribal leaders. The growing turmoil prompted the top U.N. official in Iraq, Martin Kobler, to warn Friday that the country is “at a crossroads.” The unrest in the country followed a deadly security crackdown on a Sunni protest in the northern town of Hawijah four days ago. In Iraq’s predominantly Sunni provinces, antigovernment rallies continued as preachers at protest sites called for a tribal force to protect Sunni areas. In Samarra, Sunni cleric Najih al-Mizan lashed out at what he said were “the policies of tyranny and repression” adopted by Iraqi Prime Minister Nouri al-Maliki. He said Maliki’s resignation was the only solution to save the country from the current crisis. “We call upon our tribes to form an army that can protect us from a government that does not hesitate to kill its people,” said al-Mizan. In Fallujah, Sunni cleric Ali al-Basra repeated the call to form a tribal army to protect Sunni cities. Several protesters held aloft al-Qaeda flags during the rally. In western Baghdad, a bomb blast hit Sunni worshipers as they were leaving a mosque after Friday prayers, killing five. Minutes later, a Sunni was killed when a bomb struck Sunnis near a mosque in the Rashidiya area, 12 miles north of the capital. A bomb also exploded near a third Sunni mosque in northeastern Baghdad, killing two people. There was no claim of responsibility for the mosque attacks. Also Friday, police said a bomb exploded shortly after sunset near a small restaurant in Baghdad’s Shiite neighborhood of Sadr City, killing four people. Later, police said three people were killed when a car bomb went off in a commercial street in southern Baghdad. Al-Qaeda’s Iraqi branch, known as the Islamic State of Iraq, frequently carries out attacks against civilian targets such as mosques, markets and restaurants. It mainly attacks Shiites but has also struck Sunni targets in an attempt to reignite the sectarian strife that almost resulted in civil war in the years after the 2003 U.S. led-invasion. PARIS (Reuters) - Un soldat français est mort lundi après-midi dans le nord-est du Mali après que son véhicule a sauté sur un engin explosif, ont annoncé les autorités françaises. 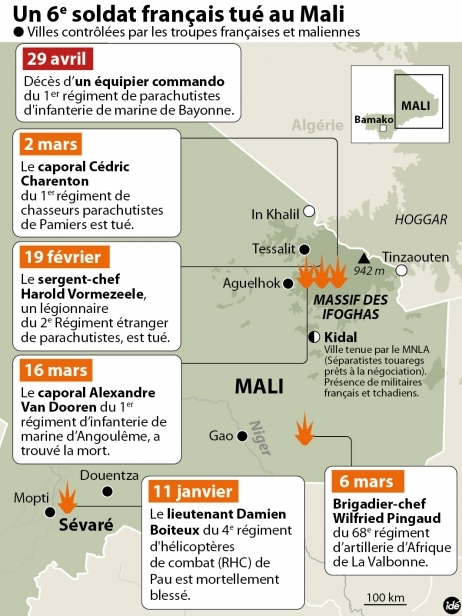 Il s'agit du sixième Français tué au Mali depuis le début de l'opération Serval, le 11 janvier dernier. Deux soldats français ont également été grièvement blessés dans l'explosion, mais leur pronostic vital n'est pas engagé, a précisé le ministère de la Défense. Ils ont été évacués par hélicoptère vers Tessalit, dans le nord-ouest du Mali. "Le président de la République a appris avec une grande tristesse la mort au combat d'un équipier commando du 1er régiment de parachutistes d'infanterie de marine de Bayonne", peut-on lire dans un communiqué de la présidence. Le caporal-chef Stéphane Duval, 32 ans, est mort dans le nord-est du pays, entre Tin Zaouaten et Boughessa, alors qu'il participait à une opération de "sécurisation" qui avait pour objectif "d'affaiblir les groupes terroristes en les poursuivant sans relâche et en détruisant toute leur logistique", précise le ministère de la Défense. "Le véhicule léger dans lequel il circulait a sauté sur un engin explosif", poursuit-il. La France a amorcé un retrait progressif de ses quelque 4.000 soldats présents au Mali. Ils ne seront plus qu'environ 2.000 à la fin de l'été et un millier d'hommes resteront après 2013 "pour une durée indéterminée", a indiqué lundi le ministre de la Défense, Jean-Yves Le Drian.